Price- Free trial and Subscription. Paid plan starts with $59 a month. 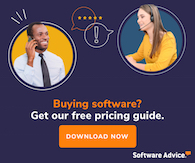 When comparing BambooHR to their competitors, in a scale between 1 to 10 BambooHR is rated 2, which is much lower than the average software cost. The two main competitors of BambooHR software include Zoho Recruit and Spidergap. Zoho Recruit is a low-cost web-based recruiting solution meant for small to medium businesses while BambooHR is a low cost, cloud-based human resource software that also targets small and medium businesses. Both BambooHR and Zoho Recruit can be deployed through on-premise and cloud-based solutions. While Zoho Recruit offers Documentation, Webinars, Live Online, and In-Person sessions as means of customer training, BambooHR, on the other hand, offers Documentation, Webinars, and Live Online training. Zoho Recruit is by Zoho software Company but BambooHR is by BambooHR Company. Spidergap is a cloud-based low cost, feedback assessment platform made for businesses of every size but in comparison, BambooHR is a low cost, cloud-based human resource software that also targets small and medium businesses. BambooHR offers business hours and online customer support while Spidergap offers Online, Business Hours, and 24/7 (Live Rep) support. Spidergap Company from the UK owns Spidergap software while BambooHR Company in the US owns BambooHR software.